USB serial adapter with DEC DLV11J pinout. Making one with a DE9 pinout would work only with PCs, and if that's already a limitation, then it might as well work with PCs that are too new even to have COM ports at all. You can build your own if you don't mind some fairly advanced soldering. The schematic and Gerbers are here. 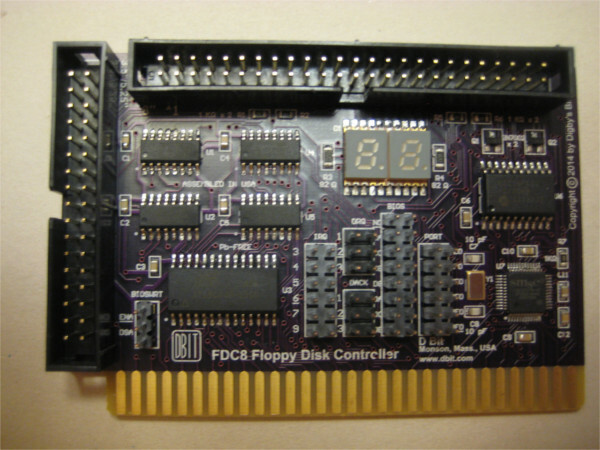 ISA floppy disk controller, with support for 8" floppy drives. Built to fill an internal need for an FDC with settable IRQs/etc. -- it turns out the iEi IMBA-G412ISA-R20 motherboard (one of the last ISA motherboards still available) reserves IRQ6 for PCI for some crazy reason even though it's always been the one used by ISA FDCs. This may be offered as a stopgap D Bit product, since the firmware still isn't quite finished for the bit-serial FDC that's in development. That board is supposed to combine uPD765 compatibility (same as this board) with raw support for alien formats, and can currently read several formats but isn't auto-detected by the motherboard BIOS for some reason. This one uses an FDC37C78 chip to do all the work (so it supports only IBM-like formats) ... and of course adds an integrated FDADAP, because, well how could it not? Copyright © 2018 by D Bit. All rights reserved.